Cougar Helicopters, Inc., Flight 91 (Cougar 91), a Sikorsky S-92A helicopter, departed St. John’s International Airport (CYYT), Newfoundland, enroute to the Hibernia oil platform (the largest offshore oil platform) located 315 kilometers (196 miles) to the southeast in the Jeanne d’Arc Basin of the Grand Banks. The helicopter departed at 9:17 a.m. and climbed to its enroute cruise altitude of 9,000 feet (2,743 meters), leveling off at 9:32 a.m. The aircraft was under the command of Captain Matthew William Davis, with First Officer Timothy Ross Lanouette. There were sixteen passengers. All on board were wearing full immersion suits. Captain Davis had 5,997 hours of flight experience accumulated over 20 years as a professional helicopter pilot. He held a Canadian Airline Transport Pilot License with a Rotorcraft rating and was type-rated in the S-92A. He had 1,067 hours in type. First Officer Lanouette had flown a total of 2,854 hours during 23 years with the Canadian Forces, and the 11 months he had worked for Cougar Helicopters. He also held a Canadian Airline Transport License with Rotorcraft rating. He was type-rated in the S-92A, and had 97 hours in type. 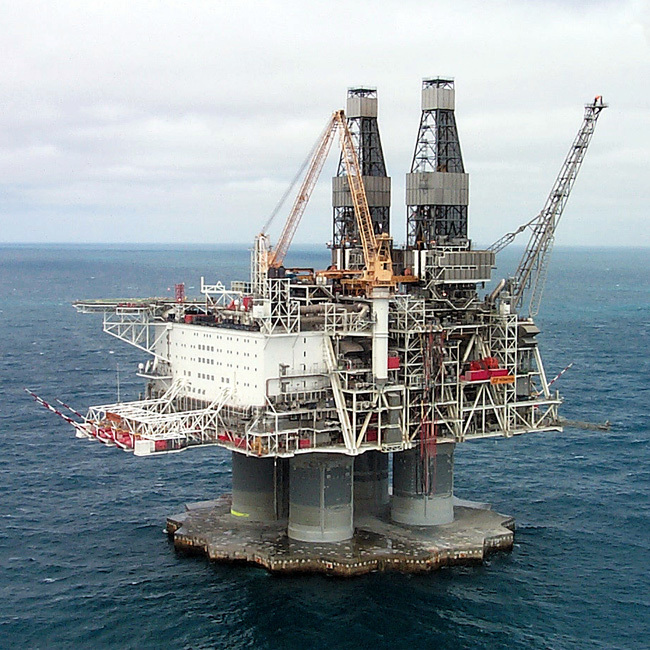 The Hibernia oil drilling and production platform, located at N. 46° 45′ 1.57″, W. 48° 46′ 58.54″, in 80 meters (262 feet) depth of water. At 9:45:05, the crew received a series of indications of falling oil pressure in the transmission (also referred to as the main gear box, or MGB). Within 1 second, the amber CAUTION light was replaced by a red WARNING light and and audible “GEARBOX PRESSURE. . . GEARBOX PRESSURE. . .” warning. Within the next 20 seconds, the transmission oil pressure dropped from the normal range of 45–70 pounds per square inch (310.3–482.6 kilopascals) to less than 5 p.s.i. (34.5 kPa) This constituted an in-flight emergency which required that the crew land or ditch the helicopter immediately. For the helicopter crew, ditching at sea must always be considered a life-and-death situation. At the time of the emergency, the surface weather along the route of flight was estimated as wind from the south-southeast at 22 knots (11.3 meters per second) (Beaufort Scale 6) and waves of 2.5 meters (8.2 feet) with a period of 7 seconds (Sea State 5). The water temperature was 0 °C (32 °F.). There were significant questions as to the survival chances of those on board Cougar 91. The request was approved by air traffic control and Cougar 91 turned back toward St. John’s, approximately 54 nautical miles (62 miles/100 kilometers) away. Captain Davis began a descent from 9,000 feet (2,743 meters) at 9:45:31. The helicopter’s turn toward St. John’s was completed at 9:45:47. At 9:45:58, Captain Davis told First Officer Lanouette that he was initiating a descent to the water and had Lanouette begin the emergency procedures check list. Finishing the emergency check list, First Officer Lanouette informed Captain Davis that they were in a LAND IMMEDIATELY condition. Davis replied that he was going to level off at 1,000 feet (305 meters). At 9:51:50 the pilot increased collective pitch to stop the descent. Engine torque increased and Cougar 91 leveled off at 800 feet (244 meters). The flight crew suspected that the low oil pressure warnings were actually a sensor problem. Their previous training had suggested that any imminent problem with the transmission would be preceded by noises and vibrations, which they had not experienced. Also, because the oil temperature indication had not increased, they suspected that the transmission had not actually lost oil at all. At 9:55:15, power to the helicopter’s flight recorder was cut off, indicating that something had occurred. There is every indication of a tail rotor drive failure. The helicopter’s main rotor r.p.m. increased from 103% Nr to 107% Nr. Ten seconds later, 9:55:25, the helicopter yawed to the right. The pilots lowered the collective, and moved the cyclic left and added left anti-torque pedal. At 9:55:36, the first officer called Gander, saying that they were ditching. At 9:55:37, Cougar 91 rolled right and the rate of right yaw increased to nearly 4° per second. At 9:55:44, the yaw rate increased to 20° per second. At 9:55:47, both engines were shut down. 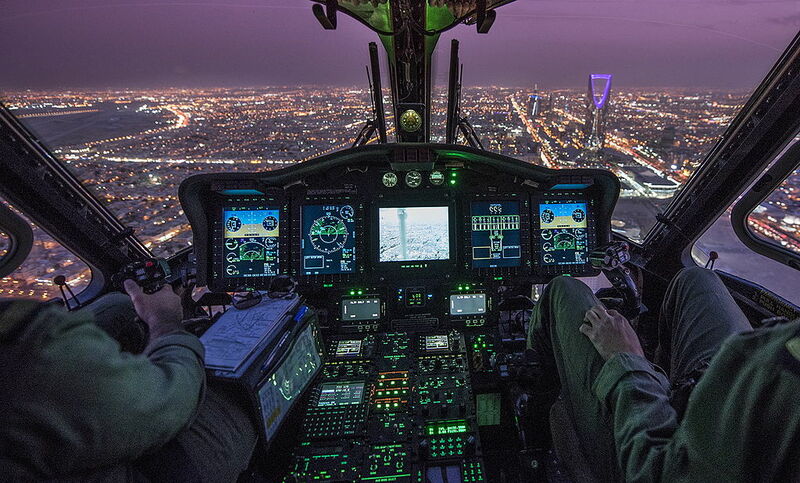 Descending through 600 feet (183 meters), the helicopter’s airspeed was 90 knots (167 kilometers per hour). Rotor r.p.m. fluctuated between 105% and 95% as the pilots raised and lowered the collective. The S-92 appeared to be in a stable autorotation descending through 425 feet (130 meters) at 75 knots (139 kilometers per hour) with 98% Nr. It then rolled to the right, reaching a bank angle of 57°. The main rotor accelerated back to 105%. Passing through 400 feet (122 meters) the collective was raised and the main rotor r.p.m. began to droop. The helicopter was traveling downwind at this time, with an estimated 32 knot (60 kilometers per hour) tailwind. The aircraft went through a series of extreme pitch, roll and yaw changes as the flight crew fought for control. At 09:55:54, the crew began an autorotative flare at 220 feet (67 meters). 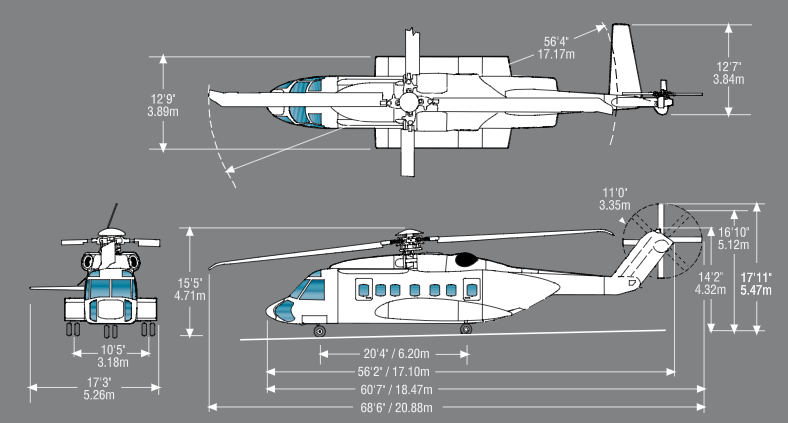 The Sikorsky S-92A descended through 90 feet (27 meters) with a rate of descent of at least 2,300 feet per minute (11.7 meters per second), possibly much greater, and an airspeed of 66 knots (122 kilometers per hour). The main rotor was decelerating through 81% Nr. The helicopter was in a 16° nose-up attitude with a 9° left bank. Cougar 91 hit the water at 9:56 a.m. The force of the impact was so great that the fuselage structure failed. The forward section, including the cockpit, broke off, as did the tail boom. The cabin section rolled over to the left and the aircraft sank immediately. The location was N. 47° 26′ 4.17″, W. 51° 56′ 42.53″. Of the 18 persons on board Cougar 91, only one passenger—who had been seated on the right side of the passenger cabin, just forward of center, Seat 3D—survived. All others were found still strapped in their seats. They had received major lower limb fractures, spinal injuries, etc., and drowned. 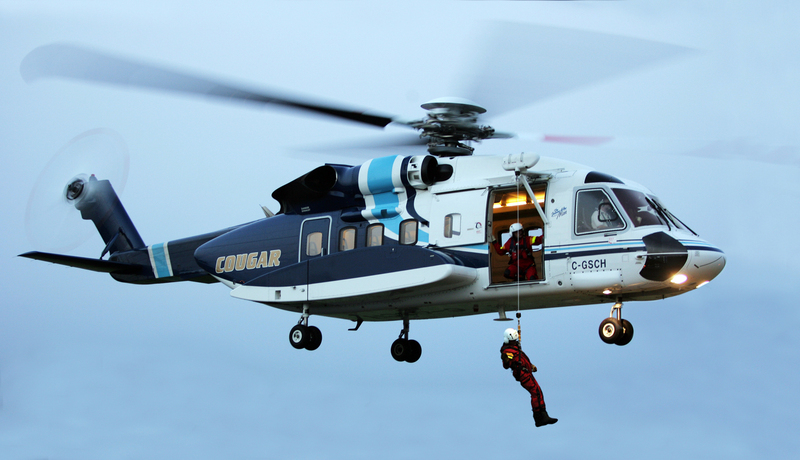 The survivor was rescued by Cougar Rescue 61, a company S-92A helicopter specially configured for search and rescue operations. He had been in the freezing water for approximately 1 hour, 20 minutes. Wreckage of Cougar 91 was recovered from the sea floor at a depth of approximately 550 feet (168 meters) and returned to St. John’s for analysis. Examination of the the helicopter’s rotor blades showed that the main rotor was turning slowly at impact, and that the tail rotor was not turning at all. The investigation revealed that two of three studs attaching the transmission oil filter bowl to the transmission housing had fractured from over-stressed fatigue fractures. This allowed the transmission oil to rapidly drain. This had occurred previously with another Sikorsky S-92A, VH-LOH, which made and emergency landing in Western Australia, 2 July 2008. Sikorsky determined that the original titanium studs should be replaced with steel studs and made changes to the Aircraft Maintenance Manual procedures. The bevel gears of the transmission’s tail rotor drive pinion were completely stripped away, as a result of frictional heating of the transmission operating without oil, and resulted in a complete loss of tail rotor drive. 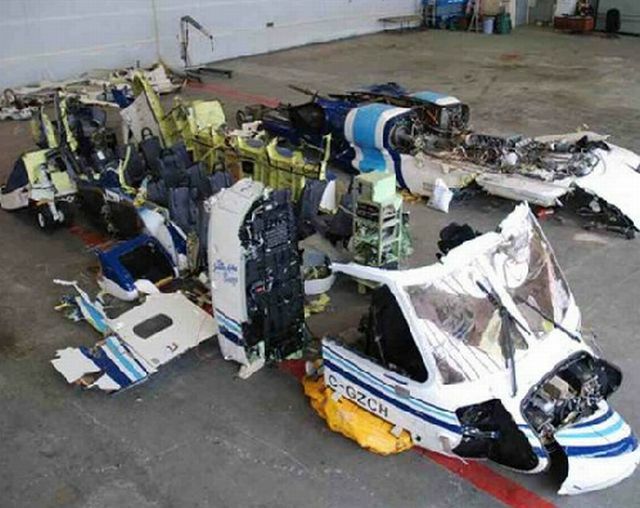 During the investigation, it was determined that Cougar Helicopters had not properly followed the mandatory procedures required by the Aircraft Maintenance Manual, which were intended to discover damaged studs prior to failure. The flight crew misunderstood the aircraft systems, which led them to misdiagnose the problem. A factor was their previous training regarding transmission noise and vibration. The flight crew had significant trouble controlling the helicopter following the tail rotor failure. Shutting down the engines prior to lowering the collective resulted in a significant loss of rotor r.p.m. As the aircraft pitched, rolled and yawed, they were unable to turn the helicopter into the wind. They began their autorotative flare at too high an altitude with too low airspeed, which resulted in a nearly vertical impact. Because of the very low main rotor r.p.m., the impact forces were high enough to destroy the helicopter. 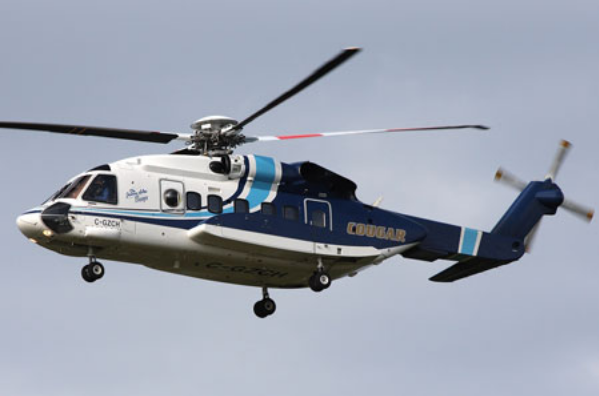 Cougar 91 was a Sikorsky S-92A, registered C-GZCH (c/n 92-0048). The company had named the helicopter The Jeanne d’Arc Breeze. 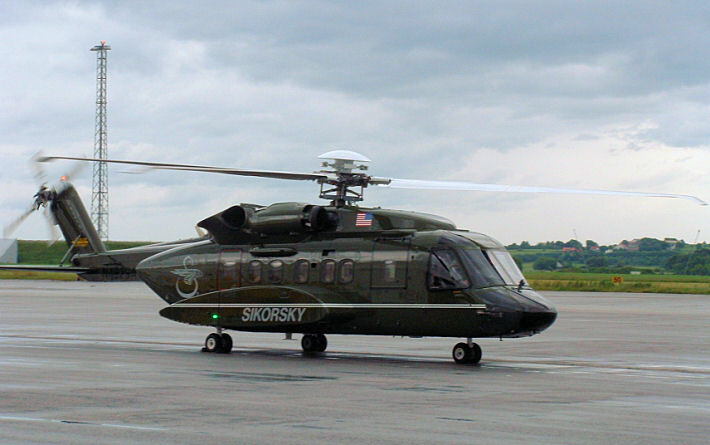 It had been completed by Sikorsky in 2006 at the Coatesville, Pennsylvania, plant, and was initially registered in the United States as N71143. The helicopter had accumulated a total of 2,194.3 flight hours (TTAF) since new, and 1,773 cycles. The Sikorsky S-92A is a twin-engine, medium lift transport helicopter with a single main rotor and tail rotor. The tricycle landing gear is retractable. The S-92 is a development of the Sikorsky S-70 Blackhawk military utility helicopter. It is operated by a flight crew of two, and can carry nineteen passengers. The helicopter has an overall length of 68 feet, 6 inches (20.879 meters) with rotors turning. The fuselage is 56 feet, 2 inches (17.120 meters) long, and has a maximum width across the sponsons of 12 feet, 9 inches (3.886 meters). The overall height is 17 feet, 11 inches (5.461 meters). The S-92A has an empty weight of 15,575 pounds (7,065 kilograms) and Maximum Takeoff Weight (MTOW) of 26,500 pounds (12,020 kilograms). 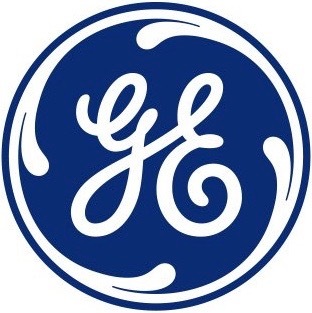 Power is supplied by two General Electric CT7-8A turboshaft engines rated at 2,740 shaft horsepower, each. This is a single-spool, front-drive, free-turbine engine with a 5-stage axial-flow, 1-stage centrifugal-flow compressor section, and a 2-stage gas generator turbine and 2-stage free power turbine. The engine is equipped with a Full-Authority Digital Engine Control (FADEC) system. The CT7-8A is 4 feet, 0.8 inches (1.240 meters) long, 2 feet, 2.0 inches (0.660 meters) wide and 2 feet, 1.0 inches (0.635 meters) high. It weighs 542.0 pounds (245.8 kilograms). The CT7-8A has a Maximum Continuous Power rating of 1,523 shaft horsepower at 44,660 r.p.m., Ng (22,200 r.p.m., Np). The Takeoff Power rating is 1,879 shaft horsepower for Take-off (5-minute limit). For emergency situations, the engine can produce 2,043 shaft horsepower at 46,340 r.p.m., Ng, for 30 seconds (One Engine Inoperative, or OEI). 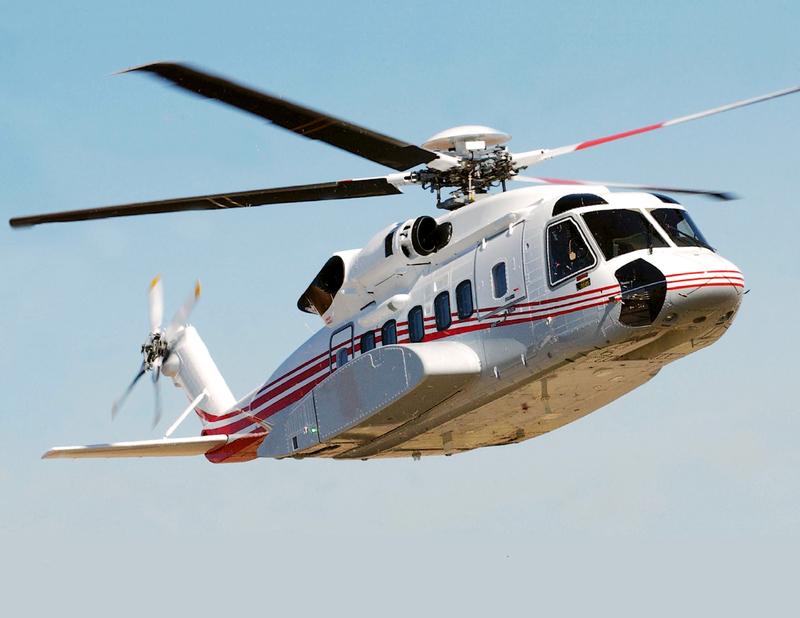 The Sikorsky S-92A has a maximum continuous cruise speed of 151 knots (280 kilometers per hour). Its maximum speed, VNE, is 165 knots (306 kilometers per hour). The service ceiling is 15,000 feet (4,572 meters). It can hover in ground effect (HIGE) at 9,200 feet (2,804 meters), and out of ground effect (HOGE) at 6,700 feet (2,042 meters). With one engine inoperative, the helicopter’s service ceiling is 5,500 feet (1,676 meters). The maximum range, with 30-minute fuel reserve, is 480 nautical miles (889 kilometers). The S-92A is certified for Category A operations, meaning that, if one engine fails during takeoff, it can either return to the takeoff point or continue to fly away on the remaining engine. 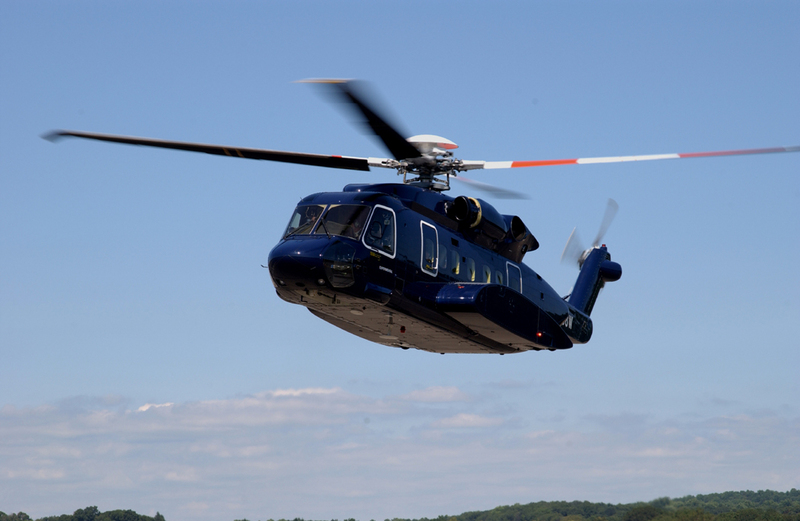 More than 300 Sikorsky S-92s have been built in both civil and military variants since 1998. It remains in production, and has been selected as the next U.S. presidential helicopter, currently designated as VH-92A. This must have hit you pretty hard given your experience in helos. i wonder what you think personally about the crew and their response to the situation. are crews more thoroughly prepped on tail rotor and main blade rotor failure scenarios after this accident. only ten years ago, so devastating. Cheers to you and your site. As a flight instructor, chief flight instructor and chief pilot, I have rarely come across what I consider to be adequate transition and recurrent training. It costs money—a LOT of money if really done properly—and doesn’t add to the profit line. The prevalence of multi-engine helicopters has reduced the practice of autorotations. I know of pilots who have never done an actual touch-down auto in a real helicopter. I love autos, they’re a kick! But to be good at it, like anything else, you must PRACTICE. I spent over 6,000 hours flying helicopters over the ocean and always dreaded the loss of transmission oil pressure. (Sitting right here on my desk is a main transmission sun gear with a large chunk of its teeth missing.) This is one of the few LAND IMMEDIATELY emergencies, and when one looks down at that cold ocean and the wind-driven swells, you can’t help but think, “Maybe we can make it to the beach.” But being Professional means Doing it the Right Way Every Time. 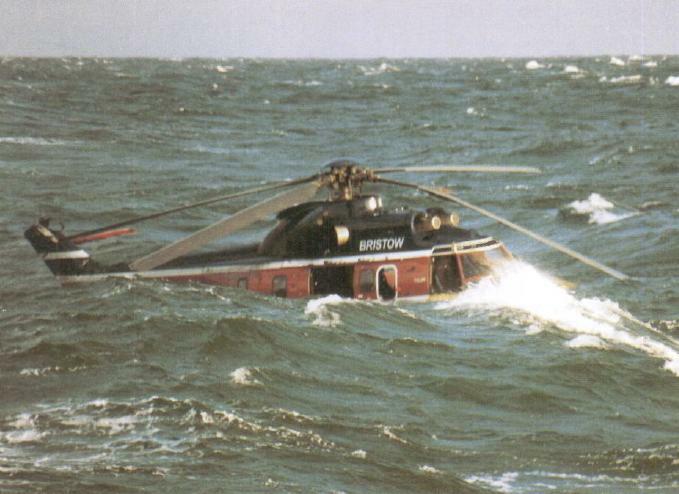 I understand the captain’s decision to attempt to return to base, but what he SHOULD HAVE DONE is to land the Sikorsky on the water while he was still in control, and still heading into that 22 knot wind. After he turned away from the wind and the tail rotor drive bevel gear stripped all of its teeth, things just became impossible. Tail rotor failure requires shutting down the engines to eliminate torque, but you have to lower the collective lever first, or, as in this case, you lose too much rotor r.p.m. Most multi-engine helicopters have the throttles located overhead, so while one pilot flies the helicopter, the second pilot has to shut down the engines. In this case, it seems that the two pilots didn’t coordinate their actions. According to the accident investigation report, the vertical velocity of Cougar 91 may have been as high as 5,100 feet per minute on impact. Do you mean “droop”, Eric? No, that’s a technical term in helicopter-speak. It refers to a “drop” (decrease) in engine or rotor r.p.m. caused by an increase in load. When the pilot raised the collective to reduce the rate of descent, the increased pitch angle increased drag, and the rotor slowed. Without engines, it is not impossible to regain the r.p.m., but by 400 feet, the time was running out for CHI 91. OK I wasn’t sure if it was drop or droop, but I know little about helicopter lingo. Thanks for explaining.